Golden Syrup Sponge Cakes – Create, Make & Bake! 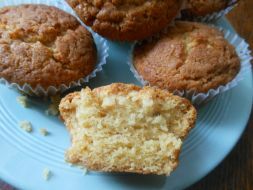 I was going to make the children some fairy cakes but I wanted to make them a little different so I decided to try using some golden syrup and brown sugar in the recipe. It actually turned out pretty well. I think this recipe would work really well as a small loaf or as a tray bake as well. Add the margarine & sugar to a bowl and cream until smooth.